All I could think was: I’m not dressed for this. As my fork sank into the buttery tentacles, my khaki pants and flip flops suddenly felt inadequate. 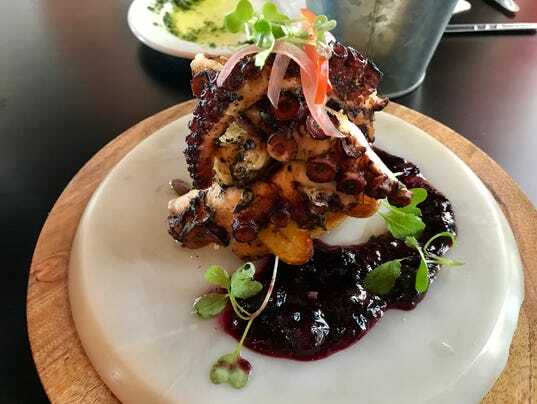 As I swiped at the accompanying blueberry compote, still marveling at the stunning perfection of this octopus, I couldn’t help but wish I’d picked a nicer T-shirt for the occasion. 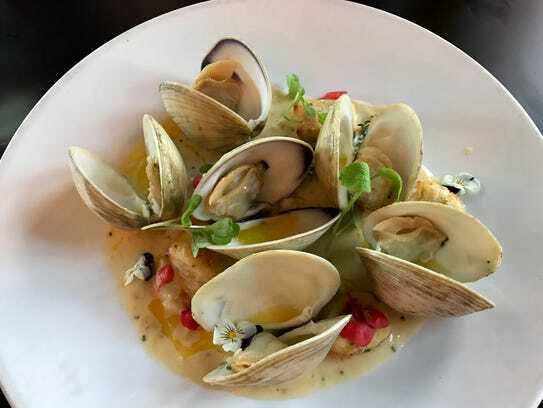 Taverna comes from some of the same forces behind Dante’s Coal Fired Pizza on the north side of the Cape, with former Dante’s chef Jerson Prado in the kitchen and former Dante’s manager Kyle Turner performing those smoky magic tricks in the dining room. Dante’s, it seems, was holding these guys back. Crisp gnocchi with clams from Taverna Wood Fire Kitchen in Cape Coral. This isn’t just a good restaurant, Taverna is an excellent one — mind-blowing at times, in the most delicious ways. It’s excellent for its mozzarella fritta, plump spheres of cream-filled burrata dredged in breadcrumbs and fried to a greaseless crunch. And for a Caesar salad served as grilled romaine halves spattered in salty dressing and thick flakes of Parmesan cheese. It’s mind-blowing for its crispy gnocchi with clams, a dish that starts with square, scratch-made dumplings the size of large postage stamps. The gnocchi are first baked, then nestled among giant top-neck clams whose arching shells glisten under the bar’s Edison-bulb lighting. Teeny tiny nasturtium flowers dot the plate, adding a pop of color and a verdant but subtle bitterness. Equally delicate ciopollini onions are in there, too; a background pop of sweetness. The clams are sweetly briny, the gnocchi chewy and tender. A white-wine-butter sauce marries things happily, until the union’s disrupted by the greedy tines of your fork. Taverna’s menu says its pastas are “made fresh daily” and I believe it. I could taste it in the tangly squiggles of spaghetti buried beneath pillowy-soft meatballs in a spicy red sauce. And I could taste it in a nest of fettuccine ribbons cloaked in Alfredo flecked with crosscut asparagus and more flaky Parmesan. Taverna makes pizzas, too, the thin-crust kind that blister and crisp in this oven’s blazing heat. 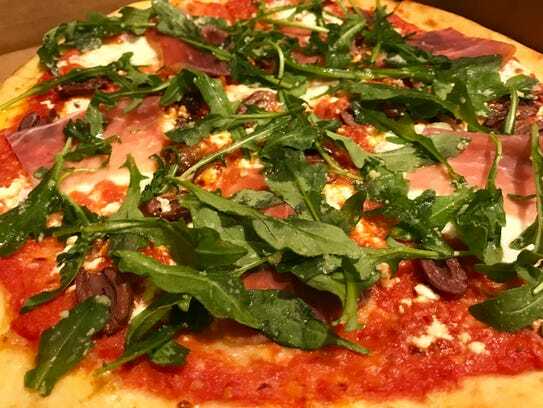 They’re excellent covered in salty prosciutto, kalamata olives and arugula. Or with bits of scallops, shrimp, clams and mussels in a spicy blush sauce. I was less thrilled with an order of pesto-laced polenta that tasted like it had been sitting around all day; heavy, pasty and thick. Taverna’s calamari, while tender enough, seemed like a pawn, an afterthought thrown in to appease the I-don’t-eat-octopus types. 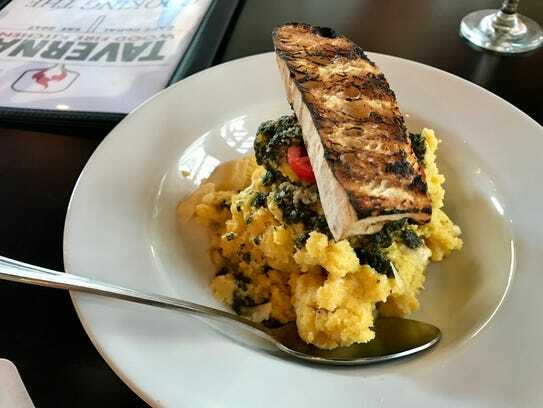 Pesto polenta from Taverna Wood Fire Kitchen in Cape Coral. Taverna’s prices are more T-shirt than tuxedo, as well. That ever-so impressive octopus costs all of $11.79. The mind-blowing gnocchi are $15.79, the caviar-topped scallops $21.29.